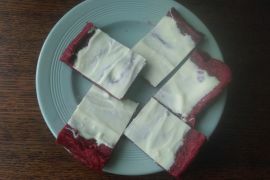 Red Velvet Brownies (Reddies?) – Create, Make & Bake! Not really brownies, but it’s low FODMAP and IBS friendly so it’ll do. I don’t think they’re very nice, but everyone else liked them. They’re interesting. 1. In a small saucepan, melt together the butter, white chocolate and milk chocolate until smooth. 2. Leave to cool slightly, in a separate bowl mix together the eggs, vanilla, brown sugar and red food colouring. Preheat oven to gas mark 4/ 180*C/350*F. Line an 8×8 brownie tin with grease proof paper. 3. Mix the melted chocolate mixture into the other mixture, mix well and pour into the tin, bake for 20-25 minutes or until skewer comes out with sticky crumbs attached. 4. Leave to cool a bit, pour the melted white chocolate onto it a smooth out. Wait for the chocolate to set before cutting. Done!